Sorry, we’re stuck in traffic again this week. No need to read farther (further?) if you haven’t been stuck in traffic (ha!). Stop reading if you’re a pedestrian who has never risked your life crossing the street. Turn the page if you are a cyclist comfortable with being clipped by a car, a truck driver who always finds a legal space to unload, or an office worker who has no trouble emerging from a downtown garage during rush hour. This city is growing, and that’s a good thing. But most any observer will tell you this city is losing control of its streets. 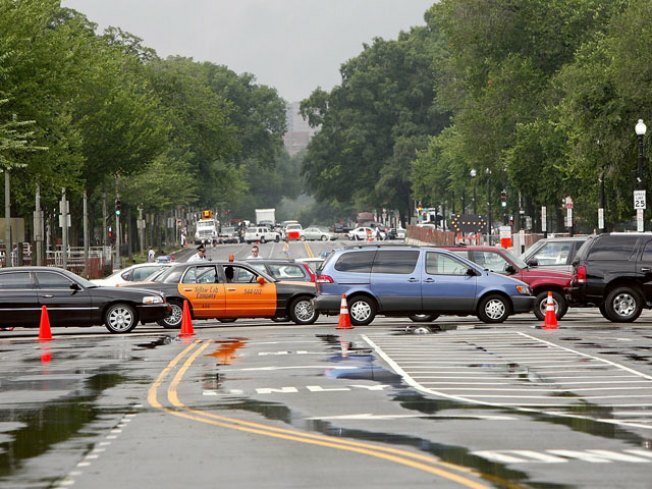 In a city famous for parking tickets, the District seems overwhelmed with moving traffic. And now, Transportation Department Director Leif Dormsjo agrees there are problems despite many longtime efforts to improve things. On Connecticut Avenue NW in particular, the closing of Beach Drive in Rock Creek Park has created a nightmare. Dormsjo is overseeing changes to city traffic lights and lanes to improve traffic, but the short-term problem is that many people are ignoring rush-hour and other restrictions. Last week, outbound traffic on Wisconsin Avenue NW came to a virtual standstill when a work crew set up in rush hour just north of Van Ness Street. The backup stretched back to Massachusetts Avenue. Your Notebook tweeted about it. We’ve also tweeted about New York Avenue and North Capitol Street, the one-way 12th Street through downtown and the near-ridiculous backup along most any street you can name. This city cannot accommodate all of the vehicles trying to get somewhere in rush hour. But it seems there could be more coordinated enforcement during rush hours. ■ Increase rush-hour fines. Too many drivers aren’t intimidated by $100 fines and up. “Just a cost of business,” one cavalier commercial driver told me one morning on 12th Street as he blocked a lane of slow-moving traffic. ■ Hire more transportation control officers and train them better. In too many cases they can’t control the streets when frustrated drivers bully through. ■ Enlist city police officers during rush hour. Somehow, when there’s a presidential motorcade forming, there are literally dozens of police cars stationed at intersections for blocks and blocks of the route. Why couldn’t that be done during critical rush-hour times on major roadways? It’s worth repeating: This growing city cannot accommodate every car or other vehicle that wants to be here. But why isn’t there a more urgent effort to enforce the rules and traffic we have? One good thing: There’s lots of time to ponder that question sitting in traffic. ■ Bethesda bottlenecks? Just up Wisconsin from the District, Bethesda is facing its own traffic worries. The good news is the Marriott Corp. is moving to Bethesda. The bad news: Many of its thousands of employees may want to drive. Bethesda is not an office park. Montgomery County Executive Ike Leggett told the WAMU Politics Hour last Friday that he’s acutely aware of the potential problems in Bethesda as it seeks to add millions more square footage. He’s also trying to figure out how to reconfigure suburban office parks that are losing popularity fast. Leggett said the national trend of people wanting to live near where they work and play is growing in Maryland, too. As of this writing, the exact location of the new Marriott world headquarters is not certain, but it is certain to affect Wisconsin Avenue and other roadways though the once-sleepy bedroom community that is now long gone. ■ Inaugural traffic? Come January, we’ll be inaugurating a new president. It’s uncertain what kinds of crowds (and protesters) would come for a President-elect Donald Trump. Democrat Hillary Clinton would have the added interest of being the nation’s first female president. We repeat our suggestion that the Washington Metropolitan Area Transit Authority close down the week of the Inaugural to show the federal government it has to get serious about funding operations for Metro, a system that carries many of the federal workers. ■ About a woman president. There’s a long history of women being denied equality in America. It continues today in pay differentials, in boardrooms and the marketplace. But women are making inroads in politics. The article notes that American women were granted the right to vote only 96 years ago. Read the whole article here at tinyurl.com/538-women-politics.